Writer/director Trey Edward Shults emerged as someone to watch with the release of Krisha a few years ago. The family drama about an estranged woman who visits family over the holidays relied a great deal on Krisha Fairchild's brilliant performance but also on the cinematography and editing which Sults used expertly to turn the familiar story into something fresh and engaging. Now Shults has put his bag of talents to great use in the post-apocalyptic/survival genre with It Comes at Night. 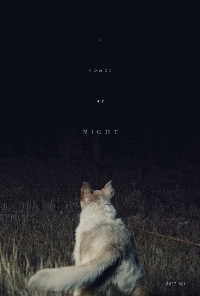 It Comes at Night is only post-apocalyptic in that it provides an easy framework to explain why a family is locked up in a boarded up house in the middle of the woods with great fear and paranoia of the outside world and, particularly, passers-by. As the movie opens, we meet the family at the centre of the story: Paul, the father (Joel Edgerton), his wife Sarah (Carmen Ejogo) and their teenage son Travis (Kelvin Harrison Jr.). The family is still reeling from a devastating blow when Will (Christopher Abbott), and later his wife and son, comes into their secluded life. It Comes at Night is a straight forward survival thriller about a group of people who will do nearly anything to stay alive. What marks Shults' movie as different is the execution. It Comes at Night is approached as a horror movie and everything, from the camera work to the music and editing, is played for maximum scares and it does so very effectively. There are no cheap scares or unnecessary special effects, this is simply good, old-fashioned scares. The use of shadows, corners and sound is brilliant and from the opening scene there's a feeling of dread just around each corner and that feeling is intensified with each passing moment. Shults bets the movie on the performances, particularly that of Harrison Jr. Our understanding of this new world is gleamed mostly through him and we also see most of the action unfold from his perspective and he brilliantly holds his own with Edgerton and Abbott who have the flashier roles. Trey Edward Shults doesn't make movies which sell on plot alone. Neither of his features scream "watch me!" on log-line alone but with It Comes at Night, he's proven what we already know but which so many filmmakers take for granted: the medium is multi-sensory. It's not just about spectacle but about using sight and sound with storytelling to engage the audience and Shults clearly understands and has great mastery of the balance. It Comes at Night is likely going to disappoint PA fans interested in world building and adventure but those who appreciate great storytelling will be impressed. It Comes at Night opens June 9. I really liked this one too. Some of his shots, like through those two fallen trees or from the hood of the truck, were well done. He keeps scenes consistently interesting.